I don’t usually post images of deep-space objects here but I had to make an exception for this one. 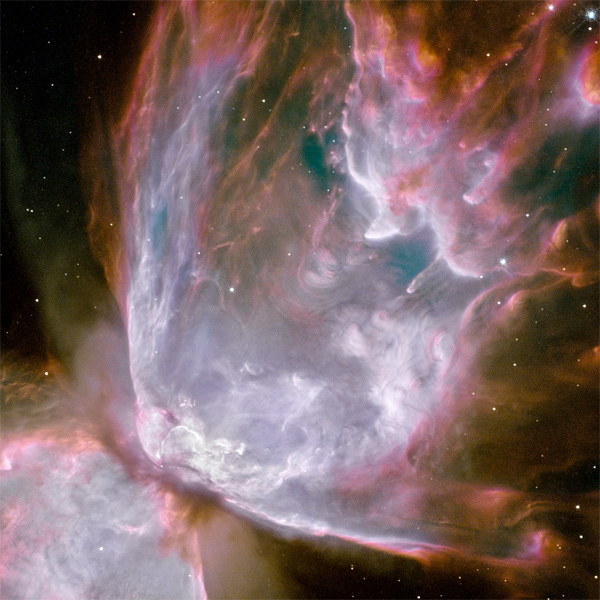 With its most recent set of optics, installed in May 2009 during the STS-125 servicing mission (SM4), the Hubble Space Telescope is returning amazingly detailed images of distant, exotic objects – like the butterfly-shaped planetary nebula NGC 6302, 3,600 light-years away, a portion of which is shown above. The dying remains of a star slightly larger than our sun is located within the brightest area at lower left, bound by a belt of dust. Curtains and streamers of superheated gases are flowing outward and are illuminated by UV radiation pouring out of the star. The gas is flowing through space at 600,000 mph and is been measured at over 36,000º F…it is made of the cast-off layers of the star itself. But from this violent death comes the seeds of creation…it’s in events like these that the building blocks of the universe are created, as the elements necessary for star formation – and life – are scattered into space. Our sun, our planet, even our bodies are made of material created in stars, and released by their inevitable deaths. Even stars have life cycles, and when they run out of the fuel needed to contain their own massive energy, they die. Many of them in amazing displays like this. The colors come from the telescope’s ability to detect gases of different elemental compositions which “burn” at different colors. Nitrogen shows up as red, for example, and is the coolest gas, while hot-burning sulfur is white. Not quite a sudden death, this star has been expelling itself into space for over 2,200 years. The entire nebula spans 2 light years…or 11,757,250,746,367 miles. That’s much further than our entire solar system’s diameter, about half as far as the distance from our sun to the next closest star. There will be a time when our sun starts to run out of its stellar fuel, swells to several times its size, and begins to cast its outer layers off into space as well. Perhaps it will look something like this to a faraway observer at a safe distance. Perhaps to our descendants, wherever and whoever they may be, looking back at the final days of their parent star. If they’re lucky it, may even be this beautiful. See the entire release image here.